It can be difficult to visualize the Trinity—the Father, Son, and Holy Spirit—even though it’s a foundational Christian topic. With all the ways that Emanuel Swedenborg challenged eighteenth-century Christianity, you might think he would’ve challenged the Trinity as well. But even here, he might surprise you. In this episode, host Curtis Childs and featured guests explore how Swedenborg’s description of the relationship between the Father, Son, and Holy Spirit differs from conventional Christian descriptions—and why it matters to religious and non-religious people alike! So, How Many Are In Your Party? In his book True Christianity, Swedenborg took on many ideas held by traditional Christians. Swedenborg held that there were many paths to God, and those who follow a different religion might have different lessons to learn. But those who follow the Christian tradition must fully understand the Trinity to complete their path. Even for non-Christians, this can be a powerful way to better understand God. Where did the idea of the Trinity come from? The Bible has many verses that refer to the Father, Son, and Holy Spirit, or some combination of the three (see, for example, Luke 1:35, Matthew 3:16–17, and Matthew 28:19). Swedenborg grapples with this teaching as many thinkers before him have, looking to the Bible for a deeper understanding. We as humans are microcosms of the holy Trinity found in God. 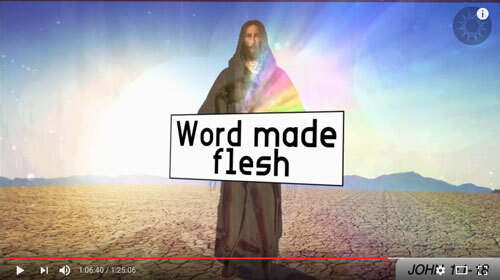 Here is a recap: Swedenborg said that there is a Trinity, but it’s not a divine trinity of three persons; it’s one God who took on a physical human manifestation in our world (Jesus Christ). The three terms Father, Son, and Holy Spirit relate to the process of Jesus being born and going through trials in order to save us. Got all that? The next section covers how the Trinity functions. But before we get to that, Curtis takes a break to share a fan video from someone who was so blown away by Swedenborg’s ideas that he got Swedenborg’s name tattooed on his arm! In the same way that the nozzle of a hose channels water into a mist, a jet, or a spray, humans channel who they are and how they think through different actions and words. Said another way, any action we make is on our own initiative (the hose nozzle), but it can be on behalf of good or evil (the water). In other words, if either God or evil spirits were able to control our actions as if we were puppets, then we wouldn’t be responsible, but we also couldn’t grow through making our own choices. We cross the line into taking responsibility for our own good or evil actions when we exercise free choice. 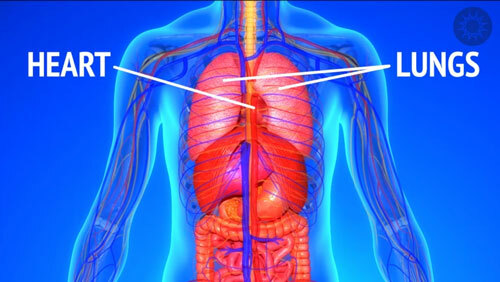 Dr. Edward Higgins describes how this connects to the symbiotic relationship of the heart and lungs. The two systems work in collaboration rather than one driving the other, and even though the heart is feeding all of the other systems, it’s not dictating how those systems function. The Trinity, too, mirrors this relationship. Jesus is like the organs taking the goodness from God and expressing it in very specific ways. If we act on divine principles, we bring the goodness of God into the world through our actions (see also True Christianity §154:6 for more on this). 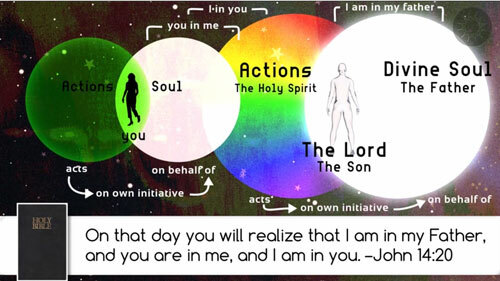 In this way, our trinity interacts with the divine Trinity. Just as we are one person with many parts, the Trinity is one God. In the next section, we look at the different parts of the Trinity. 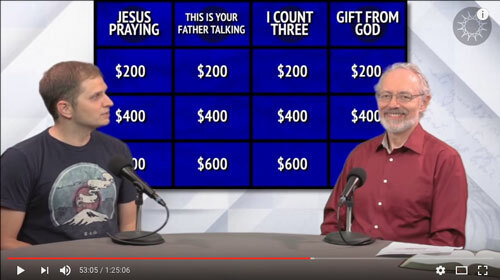 Who or what is God? What does he contain? It’s a big question that the Trinity helps to answer. Swedenborg emphasizes that God is one single being, and he uses the name Jehovah to refer specifically to God in this sense. Just because God is and contains all things doesn’t mean we can’t better understand him. One way we can know him better is to look at what Jesus did. 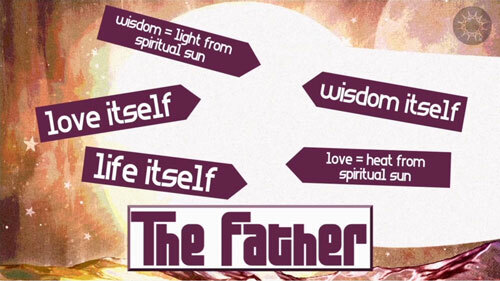 Swedenborg describes God the Father as love itself, life itself, wisdom itself. The Son is his human manifestation, taken on for the purpose of redeeming the human race. Curtis quickly summarizes this huge part of Swedenborg’s theology: God (Jehovah) came into the world in a human form (the Son of God) so that he could bring truth to the world. Through his actions he gradually united his human form to his divine form, becoming both human and divine in one person. What about the Holy Spirit? 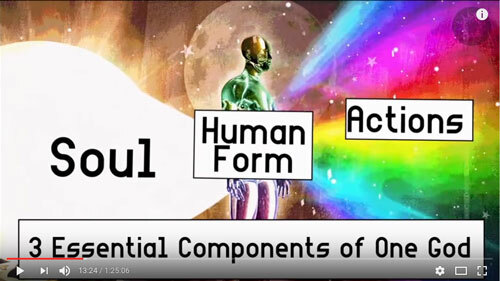 According to Swedenborg, these are the actions that radiate from God, or, to think about it another way, the life that God’s wisdom gives us. Translator Lisa Hyatt Cooper talks about how the Bible changed the way it discussed the Holy Spirit between the Old and New Testaments. There’s still a tension between the ways we understand the Trinity in the Bible—is it one God with three aspects or three persons that make up one God? To answer this, we’ll play a game show! The contestant today is Dr. Jonathan Rose, series editor of the New Century Edition translations of the works of Emanuel Swedenborg. Through the questions on the show, Jonathan explores the many common biblical arguments for a three-person Trinity. There are verses where Jesus prays to a God outside of himself; refers to the Father as a separate being; describes the Father, Son, and Holy Spirit as if they were separate; and talks about God in the third-person. Within these questions and verses, we also find references that speak to the Father, Son, and Holy Spirit as a single entity. Jesus on Earth took on the role of the divine human, displaying the reality of God as Trinity. It can be difficult to see through a biblical lens, but in fact the beginning of the Gospel of John discusses this reality at length. Regardless of your understanding of faith and God, the Trinity can be a path to better understanding him. For Christians, the Trinity is an integral part of understanding the faith, and Swedenborg offers a new way to think about it. One last thought for the show: Jesus came to earth to help us better connect to God. The traditional Christian’s view of 3 persons in the Trinity is fundamental to their belief system. Can you adopt Swedenborg’s view without throwing all of mainstream doctrine away? Did God change after he united himself with Jesus? If someone lives far away from people and has no ill will or hate for people but just wishes to avoid them, is that wrong? Is it wrong to be a hermit? Where does the soul reside in the physical body on earth and where does God’s soul reside in the grand spiritual body? Jonathan Rose also has a Bible study! You can check it out at Spirit and Life Bible Study.